Applications are processed based on eligibility and availability. We’ll notify you if your application is accepted. -You must work in Downtown Palo Alto. -Your salary must be less than $70,000 per year. -You must currently drive to work alone. -You must commit to commuting by transit 3 days per week. 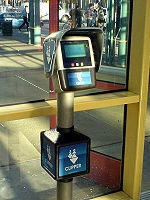 I will use the Commuter Subsidy as specified above to commute via transit 3 or more days per week in each month I receive a subsidy; I agree that I will be the only user of this Subsidy; For Dumbarton Exp, SamTrans and VTA, I will tag on each time I use this pass for commuting; For Caltrain, on my first ride of the month, I will tag on at a Clipper Card Reader at my origination station, ride the train, then tag off at my destination station. After my first ride of the month, I will not tag on/off Caltrain. I further agree to share information about my use of this Subsidy with the TMA in order to continue to receive it. If my employment changes for any reason while receiving a subsidy, or my card is lost or stolen, I agree to notify the Palo Alto TMA promptly.